The Vieweg GmbH celebrated its 40th anniversary last week. 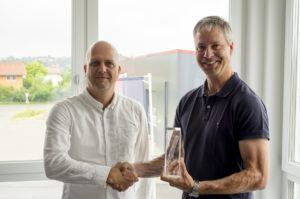 One of the first congratulates was the ViscoTec GmbH. To mark the occasion and to thank for the successful cooperation, the senior manager of the business unit components & devices of ViscoTec, Thomas Diringer, presented the managing director of Vieweg, Till Vieweg, an eco-PEN lasered in a glass sculpture. Since 2008 Vieweg is an official preeflow distributor and sells the products in Germany, Austria, Rumania and in the Czech Republic.